This product is no longer available. The MMC220 Moisture Meter has been updated to the new Orion Line of pinless moisture meters. Click HERE to see how the MMC line compares to the new Orion Line. For woodworkers, guitar makers, flooring installers, cabinet or furniture manufacturers, lumber suppliers, and more! The MMC220 offers a complete and portable moisture meter easy to use and easy to adjust. With its extended range Specific Gravity Species Settings the MMC220 can measure most softwoods and hardwoods as well as tropical species. The MMC220 excels at quickly and accurately scanning many board feet of lumber or many pieces of wood flooring in just seconds with no damage to the wood. Ensures that the MMC220 is measuring deeply IN the wood for a true moisture picture without damage to the wood surface and without interference from surface moisture. 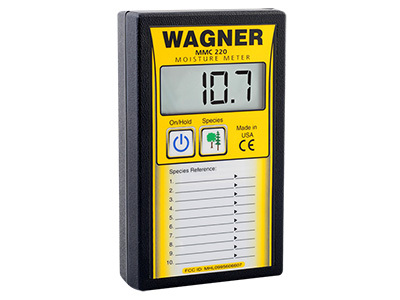 Like all of the pinless meters at Wagner Meters, there is no need to adjust moisture content readings for temperature. The Intellisense™ Technology is virtually unaffected by changes in wood temperature. So there’s no need for adjustment! Beneath a sink, under a cabinet overhang or in a tight corner, with the Press and Hold feature you can take the Moisture Content reading and the display holds the reading once the meter is removed, letting you quickly and easily document Moisture Content readings in all parts of your project. Lightweight, easy to operate, and with an extended Species Settings capability, the quick and accurate MMC220 is the best all-purpose moisture meter on the job. The MMC220 has simple species adjustments at the push of a button. The MMC220 can accurately measure the moisture content for all wood types with specific gravity between .2-1.0 including hardwoods, softwoods, tropical species, and even OSB or plywood. Note for L606 users: The L606 is no longer available. We recommend the new Orion moisture meter line.